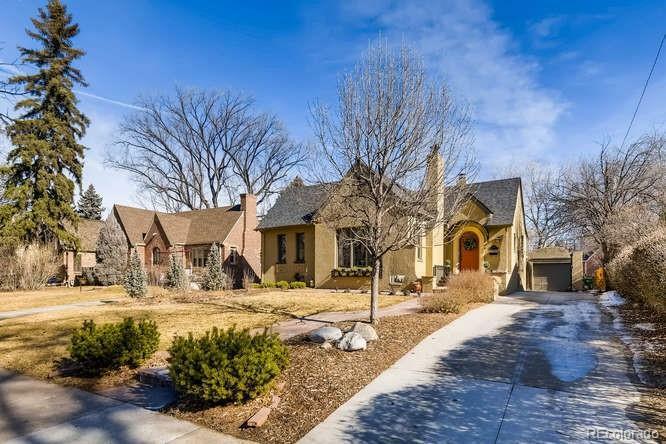 Oversized lot on iconic tree lined street. 3 bedrooms on main level w/2 beautifully renovated bathrooms. Spacious master suite w/walk in closet. No expense was spared as you feel radiant floor heating,Carrera marble, under mount lighting and a mirror that de fogs with the touch of a button. Home also includes a 2nd master suite for your guests or nanny w luxurious steam shower & double vanity. Welcoming living room, dining room overlooking the private backyard oasis. Kitchen includes stainless appliances, granite countertops, hardwood floors throughout the main floor. Basement boasts a cozy large family room surrounded w builtin book cases including 2 desks, gas fireplace. The finishing touches are everywhere you look: Front porch welcoming arches (stained glass), ring security system, Batchelder tile fireplace with gas log inserts. To top it off you are 1 block form the shops at Kearney Street; Cake Crumbs, Neighbors Wine Bar, Oblios Pizzeria plus more.